This Royal Sunbeam Light Roadster was made during Sunbeam’s changeover from John Marston Ltd to AMC, who had purchased the company. Although they continued with Sunbeam’s range of bicycles, updating model names accordingly, for several years the company’s frame numbering system did not follow the rigid system previously used. I was able to tie this example down to the specific year of 1937 because it has a ‘Model AW’ Sturmey-Archer hub, introduced in that year, and the bicycle’s model name – ‘The Royal Sunbeam’ – can just about be discerned on the seat tube (photo above). The equipment also tallies with the year of production: as you can see in the catalogue extract, roller lever brakes and Westwood rims were available for an extra 5/-. 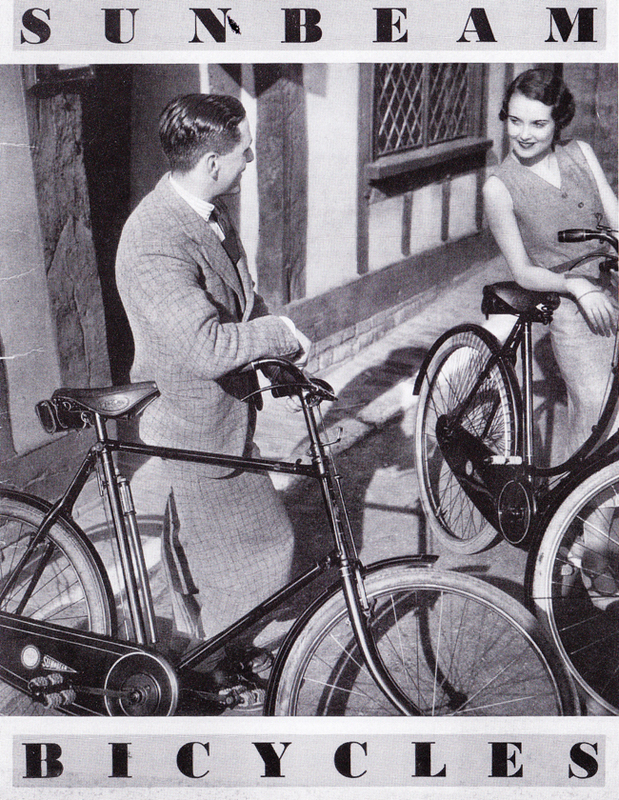 Nevertheless, a 21″ size frame was not mentioned in the 1937 catalogue, although it was made in 1936 and 1939. In the book ‘Sunbeam Cycles’ the ‘OE’ frame series is mentioned as being from 1939, but it also says that the ‘Royal Sunbeam’ name was dropped in 1938 and changed to ‘Sunbeam Royal’ in 1939. So 1937 is my best estimate. Perhaps it’s a 1936 frame, sold the following year with 1937 equipment? As I mentioned, the changeover years are confusing. The machine itself is in excellent order, with original unrestored paintwork. The original transfers (decals) on the headstock and chaincase are in very good condition. I had it serviced and new tyres and tubes fitted, in 2012. One handlebar grip is damaged, but usable. The tyres need pumping up and then it’s ready to ride.